We'll start by discussing your property's needs and develop the project's parameters. We are prepared to offer a range of choice plant material and/or hardscape options and will work with you to establish direction, budget, and a time frame. Whether we are installing an ornamental flower pot or an entire irrigation system, we will work with you to figure out the proper approach for the installation strategy, either as a whole or phased out over several months, or even years. Maintenance. Tree, Land, Lawn Care. We offer a variety of maintenance services; fine gardening, weekly lawn mowing, irrigation, annual ornamental container installations, fruit/vegetable gardens, organic root feeding and fertilizing, tree work and care, brushcutting/bobcat work. We take great pride in the relationships we've formed with our clients and in the strong network of affiliations that we have formed over the years. We will work with you to formulate a garden care plan that is tailored to your specific needs, so that your landscape flourishes and continues to grow as a source of enjoyment and beauty for years to come. 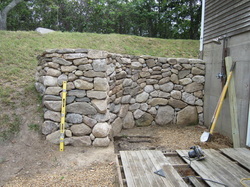 We design and install stonewalls, walkways, patios and pergolas. Much like the foundation of a home, your hardscapes must be well planned and installed, in a sense, creating your property's framework. 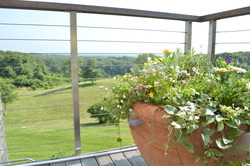 We are dedicated to enhancing the beauty of your property's potential with an accompanying pallet of plant materials. Our wide variety of landscape excavation equipment ensures proper execution of projects, and in a clean and timely fashion. Plantings. Ornamentals. Our very own Nursery Stock. The beauty of a midsummer flowering perennial garden is its ability to adapt to the environment and provide continuous blooms of colors and fragrances all summer long, year after year. When possible, we use the most deer resistant plant material. Native plants truly compliment these landscapes we create, and we utilize them as much as possible. Most of are grown locally and are acclimated to the wind, salt, and climate conditions. Annual ornamental flower pots can be a lovely addition and focal point to your perennial landscape, offering a more refined or contemporary design to your outdoor space. 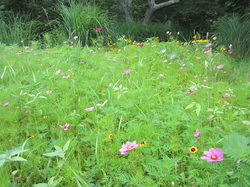 Very few things are more beautiful than a meadow of custom blend annual and perennial flowers. These gardens, filled with cosmos, coreopsis, poppies, lupines, daisies, etc. 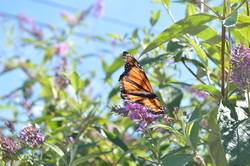 attract birds and butterflies and flower May through October! 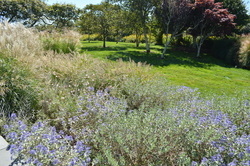 We also design and install native grass meadows as an alternative to lawn space. Talk to us today about installing a wildflower meadow on your property this spring! We offer a variety of pruning services and selective tree work. We do vista/view pruning, selective tree removals, cosmetic work, and storm-damage tree work. Every spring and fall, our crews prune over 10,000 perennials, grasses, & shrubs. 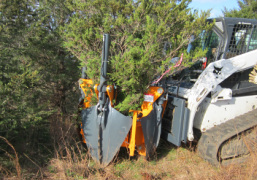 A perfect, compact "Optimal" tree spade for large shrubs and smaller trees, especially in difficult sites. 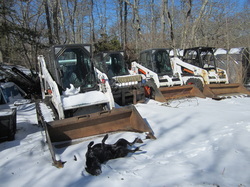 Brushcutting, Excavation, Stone work, Snow Plowing, Grade work, Road work, etc.